Houghton Mifflin Harcourt, 9780544800885, 352pp. "Nixey paints with a wide brush...a fine history that is surely controversial in its view of how victims become victimizers and how professions of love turn to terror." "Nixey clearly but untendentiously summarizes phenomena that led up to the elimination of classical polytheism." "Catherine Nixey has written a bold, dazzling and provocative book that challenges ideas about early Christianity and both how – and why – it spread so far and fast in its early days. Nixey is a witty and iconoclastic guide to a world that will be unfamiliar, surprising and troubling to many." —BBC History Magazine, "Books of the Year"
"A book for the 21st century...Nixey has a great story to tell, and she tells it exceptionally well. As one would expect from a distinguished journalist, every page is full of well-turned phrases that leap from the page. She has an expert eye for arresting details, and brings characters and scenarios to life without disguising anything of the strangeness of the world she describes. Most of all, she navigates through these tricky waters with courage and skill...A finely crafted, invigorating polemic against the resilient popular myth that presents the Christianisation of Rome as the triumph of a kinder, gentler politics...[The Darkening Age] succeeds brilliantly." "A vigorous account...Nixey paints with a wide brush, but her point is well-taken...A fine history that is surely controversial in its view of how victims become victimizers and how professions of love turn to terror." 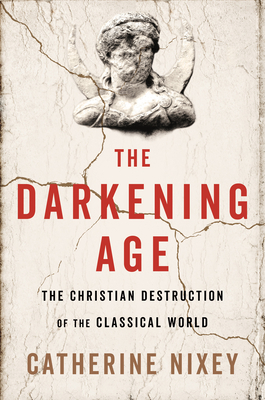 "The Darkening Age by Catherine Nixey looks at the rise of Christianity, showing how its early radical followers ravaged vast swathes of classical culture, sending the West into an era of dogma and intellectual decline." —Publishers Weekly, "Spring 2018 Announcements: History"